Here we are at the end of one year and on the cusp of a new one. Wow, another year complete. I guess that means it is time to reflect on our accomplishments and progress for 2015 and set some goals for the year to come. Ike and I really became “big kids” this year when we jumped into the Second Level arena. It is still one of the proudest moments in my riding career when I did my final salute after that first Second Level test. Seems silly to some, but after taking lessons since 2005, I finally have clawed my way out of Training and First Level purgatory that has been my place of residence for 10 years. We also finally have a musical freestyle that I cannot wait to try in public. Yes, I still need that test 3 qualifying score before we can break loose at a licensed show, but there is always the schooling show circuit to invade. Be thankful that this musical performance does not involve me singing in any way, shape, or form. And while we did well at First Level and had some respectable scores at Second Level this year, there is room for improvement. It is a double edged sword when your trainer gets a few trips on your horse. You preen like a peacock when she tells you what she likes, but then, you hold your breath knowing that the next words will be, “But, you have some blocks to work through, you need to be more through in your trot work, and not let him cheat on the flexions.” Sigh, you knew there was work to do, but this is the nitty gritty stuff that is mind-numbing, tedious, and technically challenging to get right. And that is exactly what we have worked on during my last two lessons. Flex left, flex right, left, right, left, right. Now just give Ike a “fin” and he will be ready for the next Jimmy Buffett concert! But in all seriousness, it is amazing how hard it can be to achieve a proper flexion and then maintain it in motion. Jaw jutting and bracing. Neck muscles bulging and blocking. Head diving down and asking you to carry it. A certain someone sometimes likes to grab the bit and straighten his head and ignore subtle requests. Well, perhaps if the other someone was quicker at catching things, flexions wouldn’t be such a constant struggle. So there, goal number one is to be more focused while in the saddle. Ms. C also pushed us to achieve more consistent throughness with all our trot work- straight lines (“Ask for more power!”), circles (“Your hind end is leading again.”, “Turn your horse!”), small serpentines (“Watch that hind end as you change your bend.”), shoulder in (“Where is your flexion?” “Be more supple.”) and haunches in (“Again, watch your flexion.” ” You look stiff.”) I am so busy worrying about one of Ike’s body parts and what it is doing that I forget about the rest of Ike. I suppose with time that it will become second nature, but for now Ms. C has to be that broken record. I bet some days she wants to pull her hair out. Let’s make it our next goal for 2016 to be more proactive to save Ms. C’s hair. Remarkably, as the show season came to a close, our best scores were for our canter work. Our simple changes are becoming more consistent and our medium canter is miles ahead of our medium trot. The next step for our canter is to straighten Ike’s body since he almost always carries his haunches slightly to the inside. This necessitates me recognizing the problem and then learning to ride canter in a shoulder fore position. I had better figure it out quickly if I want to achieve my final goal of riding a Third Level test in 2016. It is my most challenging goal, but why not aim high. Thank you for continuing to follow Ike and I as we forge ahead with our centerline adventures! May your year to come be healthy, happy and exceed your wildest expectations. 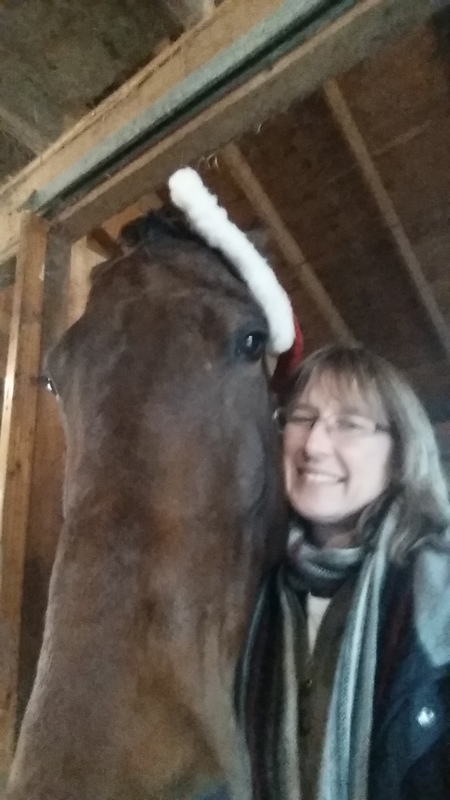 Ike and I wish you a very Merry Christmas! May your day be filled with laughter, love, friends and family. The end of the year finds me clearing out old emails and organizing my paper files to make room for the upcoming year’s correspondence. As I was working my way into my older emails, I came across an email from July 14, 2011 when I was horse shopping. It had pretty much been decided that I was headed to Florida to horse shop. I was receiving emails from Bianca who was sharing details of the horses she had available that 1) were in my price range and 2) were rideable for someone with my skill set. I smiled as I read this because it was a pretty spot on description of the horse that ended up as part of the family. I watched this old video and it made me smile. While he looks quite solid with Bianca riding him, I like to think that he has shown progress in these subsequent years with me as his primary rider. He is at least more muscled than he was as a three year old. I sometimes wonder where the other horses landed since my budget only allowed one to come home. I hope their owners are as happy with their equine partner as I am. Fingers are crossed that Bianca was right and that there is still more to achieve with our dressage aspirations! Where has the time gone? It is hard to believe that it has already been three weeks since the musical freestyle clinic, and that there are only two weeks until Christmas. This is the time of year that my riding schedule goes from five or six days per week down to three days, four if I am lucky. Many factors play into this schedule shift, and while it drives me crazy, I don’t think Ike cares that he is now a part time worker. First of all, the sun’s earlier departure from the sky really wrecks havoc with my ability to ride after work. Most days I can get to the barn with enough time to ride 30-40 minutes. However, the angle of the setting sun means that half my ride is spent riding into the blinding glare. Ike usually has a moment of pause as well as we turn. We both squint and I pray that no wildlife decides to pop out and say “Boo!” during this momentary blindness. One of our dogs has been in desperate need of some obedience work, so I took advantage of the slow down in riding to sign up for a 6 week Canine Good Citizen Class. We practice as best we can with our two other dogs “helping,” but there has been progress. Two more classes to go and it looks like he just might pass, shocking as that is to myself and everyone who knows Brownie. My work schedule right now has also gone from a steady 55 mph to the white knuckle 100 mph with deadlines of yesterday. I suppose if work had to get busy this is a better time than May or June when show season and riding is in full swing. Since this also involves more time on the dreaded Interstate 95 in the Washington DC area, perhaps it is best that I am not riding as much. The more I am on this god-forsaken road, the less I am tolerant of poor driving displays by other commuters. Needless to say that I am a bit stressed upon arriving at my exit. PSA: I believe that turn signals are STANDARD EQUIPMENT on most automobiles and trucks, yet the use of this piece of equipment seems to have declined. If we look hard enough, I’m sure there is a direct correlation to the increased use of cell phones while driving. And, lest I forget, December is also when the holidays and all the things that accompany them invade my to do list and probably everyone else’s as well. Shopping, wrapping, more wrapping, finding Christmas cards, completing Christmas cards, baking, decorating, cooking, eating, regretting all that you ate, post office visits, family visits, visits with friends and the occasional party or two. Most of the necessary stuff is done and now it is on to the baking and cookie decorating. Ike’s favorite fan club will be here next weekend for an afternoon of cookie fun! And, while I am not riding as much, I do find that when I do find the time, it is with much more purpose and focus. I already have an eye on next year and what we want to accomplish. I’ve set a lofty goal of achieving at least one score in the 70th percentile range for Second Level. I know it won’t be easy, but I am hoping that the effort to achieve that will pay off later when we move upwards to Third Level. <===Do you see that??? I actually mentioned Third Level?! I’d love to think that we will give Third Level a go by then end of 2016 as well. Guess we need to start thinking about flying changes on command and not as you please (Ike’s favorite way right now). Stay sane my friends, the relative peace of January is right around the corner. Fingers crossed that the weather is cooperative so we can continue to enjoy some saddle time!